BUENOS AIRES, Aug 4 2017 (IPS) - The final declaration of the Earth Summit held in Rio de Janeiro in 1992 stated that “Environmental issues are best handled with the participation of all concerned citizens.” However, this rarely happens in Latin America and the Caribbean. That was acknowledged by most countries in the region, which 25 years later are drafting a supranational legal instrument with the aim of making public access to information and to environmental justice a reality for people in Latin America and the Caribbean. Delegates from 24 countries are taking part Jul. 31 to Aug. 4 in the Seventh Meeting of the Negotiating Committee of the Regional Agreement on Access to Information, Public Participation and Access to Justice in Environmental Matters in Latin America and the Caribbean, known as Principle 10 of the 1992 Rio Declaration on Environment and Development. This week’s meeting in Buenos Aires, organised by the Economic Commission for Latin America and the Caribbean (ECLAC) and the government of Argentina, is to be the second-to-last debate on Principle 10, and is being held behind closed doors. The final document is to be approved in November or December in an as-yet undetermined city. At the current meeting it has become clear that the debate on how far public participation should go has not come to a conclusion, although the ECLAC-sponsored negotiations began in November 2014. The main sticking point is whether or not the document will be binding on signatory states. If an agreement is reached for a binding document, it would set minimum standards for the participating countries to guarantee public participation in environmental matters. If the decision is that it should be non-binding, it could merely become yet another declaration of principles that changes nothing. “If it isn’t binding, the impression will be that instead of taking a step forward, we took a step back,” he said. Knox was a special guest speaker during the opening of the meeting, which was held at Argentina’s Foreign Ministry, with the presence of three Argentine cabinet ministers and Costa Rica’s deputy minister of environment, Patricia Madrigal. The Costa Rican official took part on behalf of the Negotiating Committee board, which is presided by her country and Chile, and is also composed of Argentina, Mexico, Peru, Trinidad and Tobago, and Saint Vincent and the Grenadines. The draft of the Regional Agreement makes several references to indigenous peoples and establishes that it will acknowledge the right to consultation, and prior, free and informed consent, which has been recognised in most national legislations, and in the International Labour Organisation Convention 169, which regulates the rights of indigenous and tribal peoples. It also stipulates that information must be delivered in indigenous languages, and that native people must receive special assistance to access information, since they are identified as a vulnerable group. In addition, it establishes that, in every project with an environmental impact, the State has the obligation to identify the directly affected communities and promote their informed participation in the decision-making processes. “The drafts that have been released until now set out no concrete instruments which countries are required to enforce and which would empower civil society. If it is not binding, it will not be useful,” he told IPS. The debate is taking place against a backdrop of escalating disputes over land and natural resources, around the world and in this region in particular. “Social conflicts over environmental issues resulted in 200 deaths last year around the world, 60 per cent of which were documented in Latin America. The most violent region has been the Amazon rainforst, where 16 people died for defending their land,” said Danielle Andrade of Jamaica, chosen as a civil society representative in the negotiations. This situation shows the failure of governments to address the concerns of local communities in the face of extractive or land use projects that affect them. 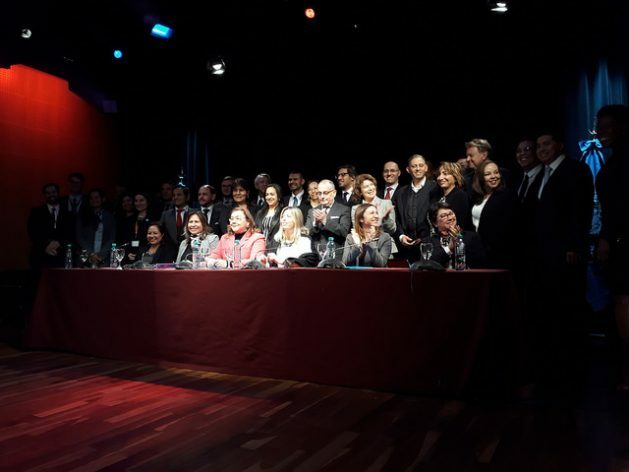 Principle 10 of the Río Declaration establishes that States must facilitate and promote social participation in debates on environmental issues, making information widely available and guaranteeing access to legal and administrative proceedings. The issue, it seems, is how to put into practice those rights which are only on paper. “Nearly every country has environmental laws, but they have problems enforcing them. That is why we believe the creation of a committee for implementation of the treaty is crucial, to which people in the region could turn with their environmental conflicts, and which should include public participation, and should have powers to intervene,” Andrés Nápoli of Argentina, another civil society representative in the negotiations, told IPS. The agreement that is being negotiated is inspired by the so-called Aarhus Convention, approved in 1998 in that city in Denmark, within the United Nations Economic Commission for Europe (UNECE). The Convention was especially useful for Eastern Europe countries, which had abandoned Communism a few years before, and had few environmental regulations. “The countries of Latin America have been developing environmental laws since the 1990s, and recently some English-speaking Caribbean nations have being doing so,” said Carlos de Miguel, head of ECLAC’s Policies for Sustainable Development Unit. “For that reason, the aim is enhancing the capacities of countries to ensure the rights established in the existing laws. Some countries have not been able to implement their environmental legislation, not because they don’t want to, but due to a lack of training and of financial resources,” he told IPS. The countries taking part in the discussions include all of the nations of South America except for Venezuela, Guyana and Surinam, and all of the countries of Central America with the exception of Nicaragua, while Caribbean island nations like Barbados and Cuba are absent. Among the articles that are under discussion in Buenos Aires are article 6, which defines the scope of the right to information; 7 and 8, on the participation of citizens in decision-making processes; and 9, which regulates access to justice. The last meeting will discuss the articles that define the institutions created by the treaty and whether or not to create an enforcement committee that, according to the majority, will define its effectiveness. “It is essential to establish mechanisms to ensure that participation is real and ensure the most vulnerable populations have access to information, because official bodies and NGOs on their own cannot mobilise participation,” said Leila Devia, head of the Basel Convention Regional Centre for South America, at the special session on implementation. That convention, which has 186 member States, deals with the Control of Transboundary Movements of Hazardous Wastes and Their Disposal.